If you have a store that is so large that the data don’t fit into an Excel file, now you can choose to Export into “Excelify: CSV” format. That will still allow you to export several entities in the same export (Products, Collections, Customers, …), because each entity is saved into its own CSV file, and they are all zipped into one nice zip file to take less space. The only limitation here is that you cannot export Metafields. 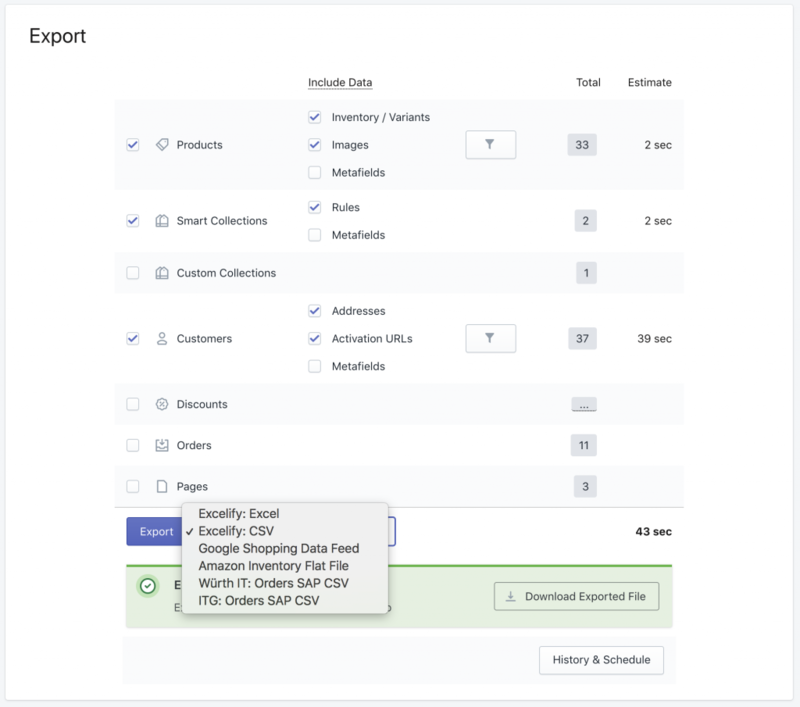 It’s because each item Metafield can be only discovered when that item is read from Shopify, but CSV files don’t allow to add columns on the fly. You can import that same zipped CSV format as well. Similarly, as Excel sheets, each CSV file will have its own name that determines what is in that file. For example, you will find Products in the “Products.csv” file, when unzipping the exported file. Excel file format is limited to 1 million rows, but this new format allows you to exceed well over 1 million rows in your exports and imports. All the columns are the same as in our Excelify Excel template. It works exactly the same as with Excel. Also, after the import, you are able to download the Import Results file and see the result columns.